If given the choice, Brent Myers prefers to stay behind the scenes instead of in front of the camera. As a longtime professional photographer, Brent has never been one to crave attention or the spotlight — especially in recognition of his own goodwill. An Ellicott City native, Brent’s family history is woven into the Howard County community. Many years ago, Brent’s grandparents bought a piece of land in Ellicott City; and in 1972, his parents built a shopping center on the property, which is now prime real estate for restaurants and retail. Before the construction of the shopping center, Brent grew up on the property and at a young age, gravitated toward two passions — photography and flying. After graduating from Howard High School and later Towson University, he worked as a photography counselor at a local camp and took up flying lessons. Brent taught flying for three years before he settled into a television career at WJZ-13, where he worked behind the scenes as a video editor in the news department for 26 years. 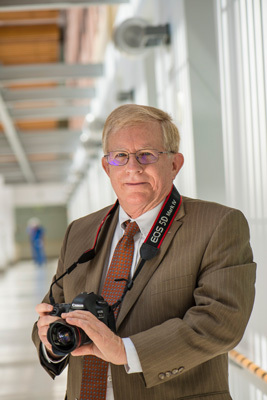 His passion also led him to become a regular freelance photographer and videographer for UMMC. For several years, Brent documented countless operations, grand rounds, and other happenings around the hospital. It is through his longtime work at UMMC that he learned how philanthropy impacts and benefits patient care and research. In 2014, Brent made his first major commitment — $25,000 to the Drs. Rouben and Violet Jiji Neonatal Intensive Care Unit (NICU) and named rooms in memory of both his mother, Charlotte, and his father, Carl. His generosity, however, did not stop there as he donated two additional rooms in memory of his grandparents. 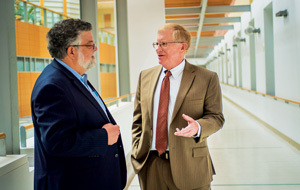 Pictured to the left: Christopher Harman, MD, director of the Center for Advanced Fetal Care speaking to Brent Myers. Brent’s most recent decision to make a commitment to the new labor and delivery unit stems from the impact philanthropy had on the Drs. Rouben and Violet Jiji NICU, which now has the capacity to care for more critically ill infants and preemies than ever before in a state-of-the-art facility. He saw an immense need for funding in the labor and delivery unit, and knew that a planned gift would be a great benefit to future mothers and babies. To learn more about the labor and delivery unit renovation, please click here.